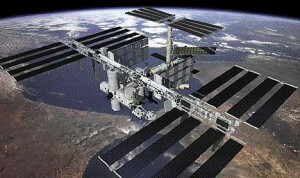 Starting 2012 strong – the International Space Station – a treat for all in Southern California. The International Space Station will be a special treat for all of us in Southern California over the next several days. We will have some truly spectacular “fly-overs” where the station will be perfectly aligned with the sun for some of the brightest passes theoretically possible. For those of you who may be new to viewing it the ISS will be visible as one of the brightest (mostly the brightest) star-like object in the sky as it passes approx 200 miles overhead at over 17000 mph. The table below gives a lot of information about each visible pass including when and where to look. The lower the Mag number the brighter the ISS will be. So for example the pass on Monday 2 Jan at 6:17pm is the brightest one in the list at -3.4. This entry was posted in ISS, Man-made Satellites by liam. Bookmark the permalink.